University of Arizona baseball coach Andy Lopez continues to do well in his recovery from open heart surgery earlier this month. He has announced a complete and full return to all coaching duties beginning with the start of preseason practices Jan. 15, 2014. Lopez, who turns 60 next month, underwent quadruple bypass surgery on Oct. 7 at Tucson Medical Center. He was released and returned home Oct. 11. “I cannot thank the entire medical team at Tucson Medical Center enough for their care and support through this process,” Lopez said. “I am grateful of the tremendous team effort by everyone involved. 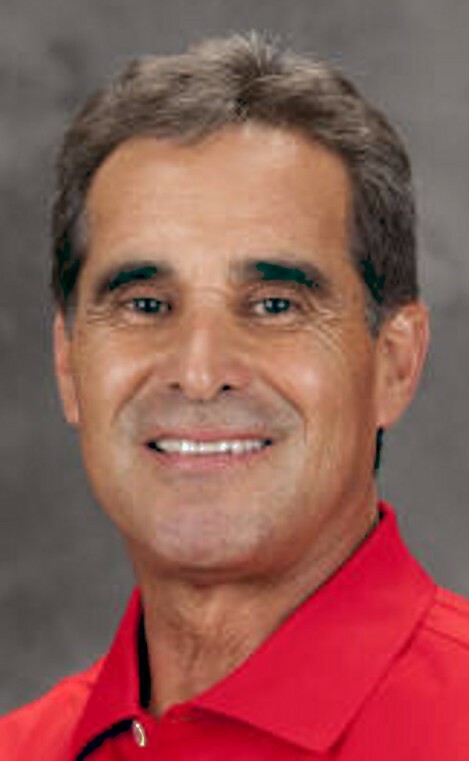 Now in his 13th season with the school, Lopez has led the Wildcats to eight postseason berths, including two College World Series appearances highlighted by the 2012 national championship. 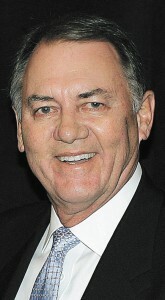 He was named Collegiate Baseball’s National Coach of The Year that season. Lopez has a 1,124-685-7 (.621) in 31 years as a collegiate head coach and is 437-267-1 (.621) in 12 seasons at Arizona. Wildcat pitching coach Shaun Cole said Lopez experiencing tightness in his back and neck for six weeks. In the week preceding the surgery, he suffered from chest pain. “Andy then scheduled a doctor’s appointment and went back for additional tests,” said Cole. 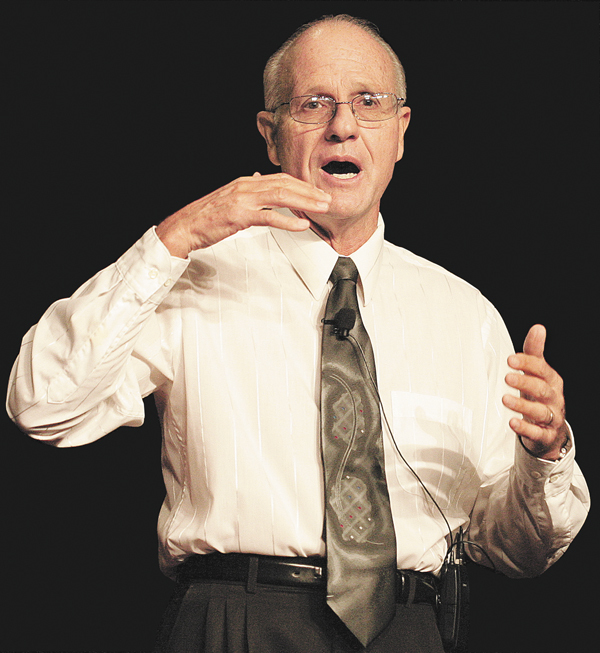 HONOLULU, Hawaii — In 1979, I asked two questions that directed my baseball research agenda: How do you pitch and throw the baseball faster; and how to do the best hitters hit and increase their bat velocities? These two questions guided me to the scientific areas of biomechanics, exercise science and visual training. My final hitting book, The Scientific Approach to Hitting: Research Explores the Most Difficult Skill in Sport, provides the player and coach with valuable evidence on how to become a better hitter. This final article is from this second hitting book. What is bat control? Can we measure it? Can we increase bat control for better hitting performances? Does bat control relate to accuracy? These questions are very important to all hitters and hitting coaches. The following published research study gives us some tangible answers. This study investigated the relationship among hitting components and bat control during the normal and choke-up grip swings. Fourteen intercollegiate and professional baseball players were randomly assigned into five hitting groups. Within each group, the following four hitting components were computed to determine the relationship between bat control in two grip conditions (normal; choke-up): (1) Swing time (bat quickness), (2) stride time, (3) bat velocity and (4) bat-ball contact accuracy. Results indicated significant differences (p =0.01) between choke-up and normal grips in swing time, stride time and bat velocity. Players using the choke-up grip swing had significant less swing time and stride time than the normal grip swing. Results also indicated significant greater bat velocities (p = 0.01) with normal grip swings than the choke-up grip swings. In addition, further results indicated no significant differences (p = .90) between choke-up and normal grips in bat-ball accuracy. These findings suggest that the choke-up grip facilitates faster swing time and stride time without compromising bat velocity or contact accuracy. 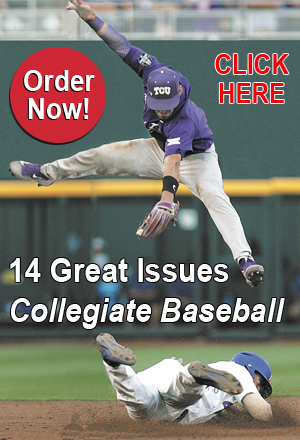 To read the entire article, order the Oct. 4, 2013 issue of Collegiate Baseball by CLICKING HERE. LOS ANGELES — UCLA Head Baseball Coach John Savage is one of the best pitching coaches in the business. In this exclusive interview with Collegiate Baseball, Savage discusses all aspects of pitching within his time-honored system. 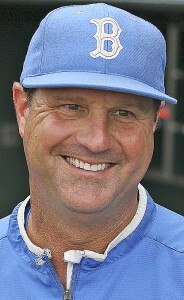 Savage has been a pitching coach on the college level for the past 21 years with stops at Nevada, U.C. Irvine, Southern California and now with the Bruins the past nine seasons. UCLA’s team ERA the last four years has been remarkable. Never in the history of UCLA baseball has pitching been so good for so long, and that is a direct reflection of Savage who teaches every aspect of pitching to his hurlers, including the vital mental side. Over his nine years, Savage has produced some of the nation’s top drafted pitchers, including Gerrit Cole (first overall pick in 2011 Draft by the Pirates), Trevor Bauer (third overall pick in 2011 Draft by the Diamondbacks), David Huff (first round supplemental pick in 2006 by the Indians) and Rob Rasmussen (second round pick in 2010 by the Marlins), just to name a few. Savage led the Bruins to their first national baseball championship at the 2013 College World Series as the Bruins rolled through the NCAA Tournament with a 10-0 record and finished 5-0 at the College World Series. UCLA ran the table against an imposing gauntlet of ranked teams. The Bruins started off by beating Cal Poly and San Diego in Regional action along with San Diego St.
Then UCLA competed at No. 4 ranked Cal. St. Fullerton and eliminated the Titans two straight. At the College World Series, UCLA knocked off No. 1 ranked LSU, No. 5 N.C. State, No. 2 North Carolina and then swept Mississippi State two straight in the Championship Series. Incredibly, the Bruins’ pitching staff only allowed four runs over five CWS games against these elite teams. In the 67-year-history of the College World Series, only one national champion has given up fewer runs than UCLA this year as California allowed three in 1957. The Bruins were the first team in CWS history to allow one run or less in each of the five games they played. “We are very traditional in the way that we utilize pitchers in games,” said Savage. “We don’t try to reinvent the position. We have specific roles in our program that we set usually within a month or month and a half of them being on campus. We try to recruit depth and pitchability along with delivery projections and toughness. Those are the main ingredients of what we are looking for. “Then we establish roles in terms of a Tuesday starter or a Friday, Saturday or Sunday starter. Sometimes that won’t be established until January. Every year is a little different depending on who you have coming back. “Then we want to establish the seventh inning relief pitcher, setup guy in the eighth inning. And certainly, you must have a closer. Our biggest thing is having our pitchers knowing their roles and having them embrace their roles so they can become the pitching staff we want to become. “We talk about one baton in two worlds. The baton is the baseball. You hand the baseball off to the starting world. Then it is turned over to the bullpen. We want to have the best starting pitching in the country and want to have the best bullpen in the nation. 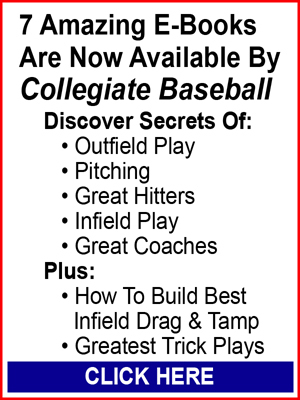 For the complete story on John Savage’s amazing pitching system, order the Oct. 4, 2013 issue of Collegiate Baseball by CLICKING HERE. The results are in with NCAA testing on flat seam vs. raised seam NCAA certified baseballs. After several months of testing at the NCAA Bat Certification lab at Washington State University, the Sept. 30 results show that the flat seam ball will travel further than a raised seam ball due to the “drag effect.” The greater the distance a ball travels, the greater the drag effect. The test was conducted with an average ball exit speed from a machine at 95 mph with a spin rate of 1,400 RPM and a launch angle of 25 degrees. These parameters were set because they replicate the settings of a typical home run or a hit that could become a home run. The average distance the raised seam ball traveled was 367 feet while the average distance the flat seam ball traveled was 387 feet — 20 feet further. Research was not able to give a difference between a raised seam vs. flat seam ball at a specific distance such as 320 feet, 350 feet and 400 feet. However, researchers believe this study is a good representation of what you will get with a raised seam vs. flat seam batted ball. 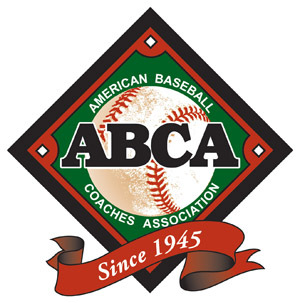 The results of the testing were sent to NCAA Division I head baseball coaches by American Baseball Coaches Association Executive Director Dave Keilitz, and head coaches will now vote on whether they prefer a raised seam NCAA approved ball or the flat seam ball for NCAA tournament use. If in the future complications involved with changing to a higher performance standard (COR) for the college ball can be resolved, Keilitz wanted to know if coaches would prefer to keep the present college ball standard of a .555 COR or if it should be increased to the pro maximum standard of .578. Keilitz will submit the results of this survey to the NCAA Baseball Committee by Oct. 21 for their Nov. 4 meeting. “I believe a decision on the ball will be made on Nov. 4,” said Keilitz in his letter to NCAA Division I coaches. “If a change is to be made, it would not be for this year, but probably the 2014-2015 school year. So teams would have use of the new ball for fall practice. If we were to change from a raised seam ball (now required by the NCAA for tournament play) to a flat seam ball, the process is fairly simple. First of all, the change doesn’t have to go through the NCAA Rules Committee, which represents all three divisions — I, II and III, because it isn’t a ball rule change. For years, NCAA Division I schools have used the raised seam baseball in practices and games since it is the ball being used in post-season NCAA tournament games. No testing was done at Washington State on the minor league specification flat seam baseball since neither the NCAA Rules Committee nor the NCAA Division I Baseball Committee has any interest in using it for tournament games at this time with the higher maximum .578 COR performance level. According to Keilitz, previous testing showed significant differences in the distances balls travel that are approved for college and pro baseball. “Previous research has shown that a minor league flat seam ball with a maximum COR of .578 hit 300 feet would go 20-25 feet further than a college (raised seam) ball with a maximum COR of .555,” said Keilitz. That would translate to 26.6 to 33.3 feet further on a ball hit 400 feet with the minor league baseball. Keilitz said that the cost per dozen for the minor league ball would run more than the college ball. The major league ball would be cost prohibitive to most schools at a cost of over $100 per dozen. Since BBCOR specification bats have been required since the 2011 season, offensive numbers have plummeted in college baseball. The poster child for lack of offense took place at the recent College World Series as only three home runs were hit in 14 games. It marked the lowest home run total since 1966 — some 47 years ago when only two home runs were hit in 15 games. The total number of runs scored in the 2013 College World Series was 86 — the lowest total since 98 runs during the 1973 CWS which was the last year before aluminum bats and the designated hitter. Over 14 games last June at the CWS, the batting average for teams was an anemic .237. From an all-time high of 62 homers at the 1998 College World Series, the numbers have sunk lower and lower with 9 in 2011, 10 in 2012 and 3 in 2013. Numbers the last three years have closely mirrored the wood bat era in college baseball which took place up to the 1973 season. Many coaches in college baseball don’t want to go back to the wild scoring games prior to BBCOR bats which featured numerous home runs and lengthy ball games. But a vocal core of coaches feel that a slight adjustment is in order that could pump offense into the game. The flat seam college baseball with a maximum COR of .555 might be the answer. Keilitz said that in a survey sent to NCAA Division I coaches in October of 2012, a slight majority (55 percent) preferred a flat seam ball. The survey also showed that a slight majority of coaches (53 percent) did not want to change the present ball COR standard. 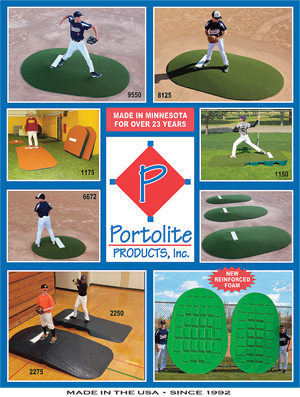 “There are a number of different styles that coaches favor in playing baseball,” said Keilitz. “Some coaches enjoy having teams which feature great pitching and defense while they manufacture runs. Other coaches like the 3-run homer. I know that coaches take this into consideration when voting for things like this. “My guess is that John Savage of UCLA probably likes the game the way it is since his teams are built on pitching and defense. When you look at the teams Skip Bertman previously built at LSU, the bats were more lively, and he took advantage of that as he loaded his lineup with nine guys who could hit home runs. He was smart doing this as they won several national titles with this strategy. Derek Johnson, Minor League Pitching Coordinator for the Chicago Cubs and a highly successful pitching coach for 11 seasons at Vanderbilt, feels a change in balls will be great for pitchers going into pro baseball. “If pitchers use the flat seam ball in college, there will be no adjustment period at all to the professional baseball (which also is a flat seam baseball),” said Johnson. Johnson believes there will be fewer blisters with pitchers when they transition into pro ball if the flat seam ball is used since pitchers won’t try to grip the seams tighter.